The men who went on to change the world of comic books forever met as high-school students in Cleveland, while working together on their school newspaper. 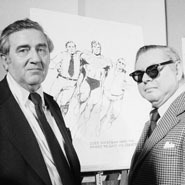 Jerome Siegel (1914-1996) and Joseph Shuster (1914-1992) created the prototype for Superman, who first appeared in 1938 on the cover of Action Comics comic book series. Shuster, who drew the character, later said he based the hero on the actor Douglas Fairbanks Sr., and the meeker alter ego, Clark Kent, on both himself and another actor, Harold Lloyd. The caped Superman soon began his long run as the star of newspaper comic strips, television shows, and movies, ultimately becoming one of the most recognized superheroes in the literary world.